Those familiar with The Great Gatsby know Tom Buchanan as an old-money polo player. It’s widely accepted that F. Scott Fitzgerald modeled Buchanan after Aiken-born Tommy Hitchcock Jr., arguably the best polo player in history. Hitchcock’s affluent family was part of Aiken’s Winter Colony and established much of the equestrian culture that makes the town appealing today. Begin the day with a walk through historic Hitchcock Woods (hitchcockwoods.org), the largest urban forest in the country. Equestrians use the property for drag hunting, carriage driving, and horseback riding, and strict rules grant horses the right of way. 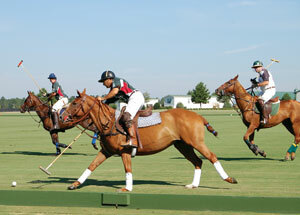 There are dozens of polo fields in the area, and matches take place three times per week from August until November. The Aiken Polo Club (803-643-3611, aikenpoloclub.org) is the oldest club in town, but from October 2–18, the 302 Polo Club (803-642-8780, 302polo.com) hosts the United States Polo Association Silver Cup, a prominent tournament that attracts players from around the world. After seeing a match, head to the Aiken Thoroughbred Racing Hall of Fame and Museum (803-642-7631, aikenracinghalloffame.com) inside Hopelands Gardens to learn more about Aiken’s equine tradition. Prior to the Civil War, Charlestonians spent summers in Aiken to escape the malaria that plagued the coast, and in the late 1800s, wealthy Northerners weathered the cold months here, establishing Aiken’s Winter Colony. The Willcox (803-648-1898, thewillcox.com) was built during this time to cater to the seasonal influx of Yankees. A small property with twenty-two guest rooms, twelve suites, a spa, and a restaurant, the Willcox has turned away the Duke of Windsor due to space limitations and discreetly received FDR when his private train car arrived at the back door, just as it did at New York’s Waldorf Astoria. For even more intimate lodging, the Carriage House Inn (803-644-5888, aikencarriagehouse.com) was built as a private residence circa 1872 and feels like home with its hardwood floors and plush sofas. It’s walking distance from downtown shops and restaurants. Before heading out to the polo fields, make a stop at the New Moon Cafe (803-643-7088, newmoondowntown.com) for their signature Moonbeans coffee, roasted next door, and a pumpkin muffin; arrive early or you may find yourself waiting in a line that extends out the door. After the match, swing by the Aiken Brewing Company (803-502-0707, aikenbrewingcompany.com) for a pint of Thoroughbred Red. The award-winning Irish red ale is always available alongside a number of other revolving taps and seasonal brews. Unlike many towns of its size, Aiken also satisfies the discriminating palate. For dinner, you can’t go wrong with Linda’s Bistro (803-648-4853, lindasbistro-aiken.com). Be sure to make reservations early, otherwise you will miss out on Linda Rooney’s seasonal menu of simple, hearty dishes such as risotto and calf’s liver with sweet onions.